"In contrast, the D700 will soon be rewarded with a very attractive bundle, including Capture NX, which thereby becomes free time promotion. 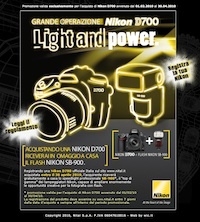 Nikon has used in recent years to launch new round of July 15, we are sure we will see a D700 right now, but Capture NX! What prevent the purchaser of the current, already extremely powerful, do not feel cheated!" The translations are horrible, but the bottom line is that we should expect some good deals on the Nikon D700 in the next few months before its replacement. In the past few weeks I received several reports that Nikon D700 is not in stock in certain stores and some retailers cannot place new orders (those could be isolated cases, please don't panic :).